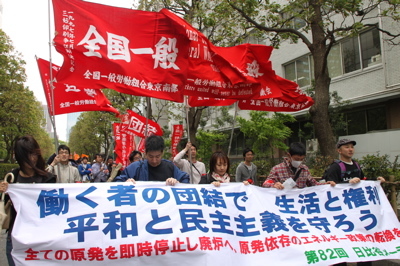 ● The National Union of General Workers Nambu is part of a larger organization of unions fighting for Labor Rights. We represent the Tokyo South region. Our Union welcomes private participation. Usually in Japanese companies, there are Japanese Unions in place, however for those who do not have a union at their workplace, they are welcome to join Nambu as a group or as individuals. As well, it should be cautioned that unions that are already set up within enterprises are usually not truly independent from management. At small and medium-sized businesses especially, it cannot be guaranteed that the workers rights are being negotiated securely and fairly without influence, interference or even reprisal from the parent company. In Collective Bargaining situations with in-house unions, the management tends to be disproportionately powerful. Thus, Nambu welcomes new members from small, medium-sized enterprises and particularly independent workers, who could be the most vulnerable. Through the Union, through Nambu, which is independent of managerial influence, workers are truly able to become strong and have a significant voice at the bargaining table. ● With many workers from different fields united under the banner of one union, and with the independent nature of Nambu, we have built a powerful voice to speak up against management of any one company. Ours is a “regionally combined union” with members from different companies cooperating and supporting one another. 70% of all Japanese workers work for a small to medium-sized business, yet only 1.2% of them are organized into Labor Unions. Thus, it is clear that the concept of an organized labor movement is a distant concept for so many people. However, it means more than ever that an organized labor is an imperative for more people to consider for the future of workers in Japan.